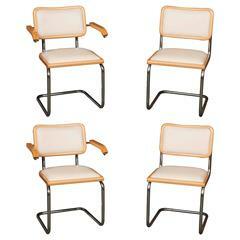 Sorry, Marcel Breuer 1928 Cesca Chair, Stendig is not currently available. A set of four (two arms and two sides) Marcel Breuer "1970 Cesca" chairs of maple, chrome and upholstered in faux leather. Made in Italy.